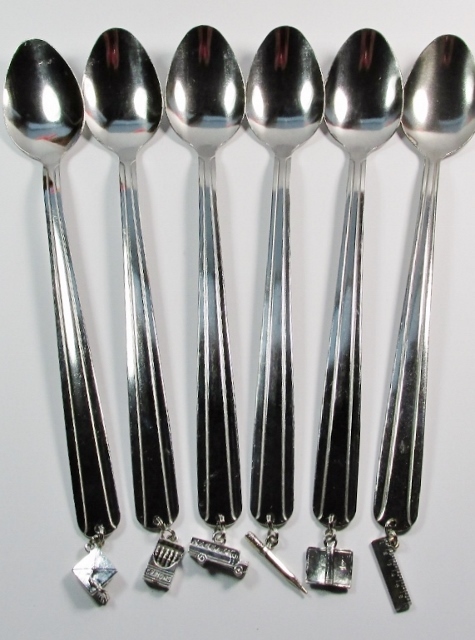 Long, medium weight, stainless steel (18/0) iced tea spoon sets with assorted metal charms. Helps party guests identify their drinks. $2.95 Flat Rate Standard Shipping in the U.S.
CARE & HANDLING: While stainless steel is highly resistant to corrosion and stain even the finest alloys will suffer if food residue is not removed soon after use. For best results and longer lasting beauty, hand wash spoons in hot soapy water, rinse, and dry with a soft towel before storing. Images, designs and text may NOT be reproduced, distributed or mirrored in any manner without express written permission from DabbleDoos Colorful Creations. Copyright �2003 - All rights reserved.